What are the benefits of BOD POD® Body Composition Measurement? Because the BOD POD® is highly accurate, it can detect even small changes in body fat and lean body mass (i.e., muscle, bones and organs). Body composition is one of the best indicators of overall health. 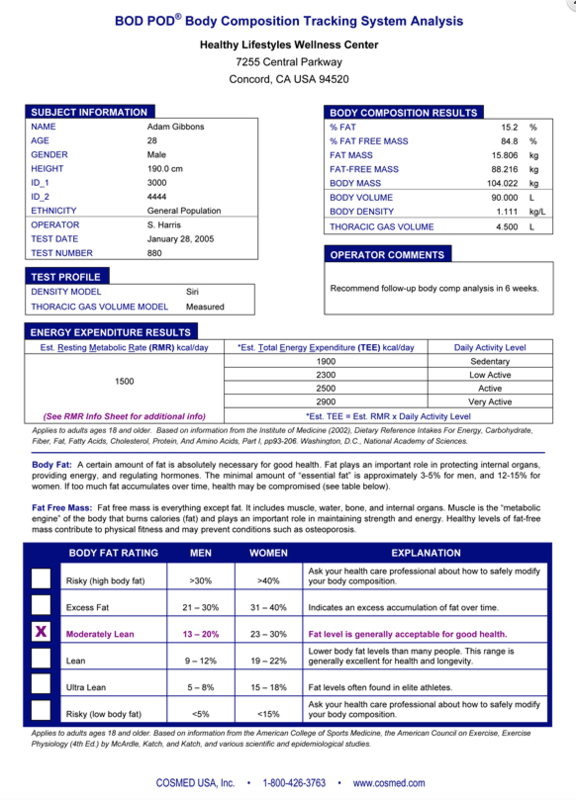 The feedback you receive from your BOD POD® test can be used to measure the success of your nutrition and/or exercise program, monitor for obesity, a risk factor for major diseases, like stroke and diabetes, help you lose or gain body fat safely, fine tune your athletic performance and more. Click here for a sample printout (under software tab). You will be sitting inside the BOD POD® cabin for about 3 minutes. However, during that time, the door will be opened and closed between two 50-second trials. Total time including goal setting and reviewing the results is approximately 10 to 15 minutes. Simply sit comfortably and quietly (no laughing or talking), relax and breathe normally and the BOD POD® does the rest. Sounds relating to the valves opening and closing may be heard, but most people are unaware of the slight pressure changes that take place. You may notice a feeling similar to being in an elevator or the initial take-off in an airplane. Click here to watch a video on how a BOD POD® test is done. 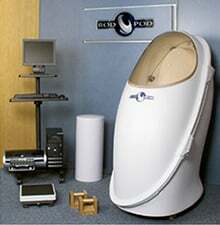 The BOD POD® which uses air displacement technology is considered to be the gold standard of body composition measurement. It is as accurate as hydrostatic (underwater) weighing, but quicker and easier to perform. The range of error for this test is ± 1 to 2.7%. No food, drink or exercise at least 3 hours prior to testing. Use the restroom before testing, if necessary. Don’t apply any lotions or skin creams prior to your test. Remove glasses and jewelry (if possible). Because of the sensitivity of the equipment, schedule subsequent visits under the same conditions (time of day, hydration levels, amount of facial and body hair, same day of cycle (women), etc.). A swim cap will be provided to compress any air pockets within the hair. How much does a BOD POD® cost? BOD POD testing costs $45 or buy a pack of two for $80. NIFS membership includes one free BOD POD® per year. Schedule a BOD POD Today!